Philly* Polenta is a great alternative to roast potatoes. Delicious and creamy! 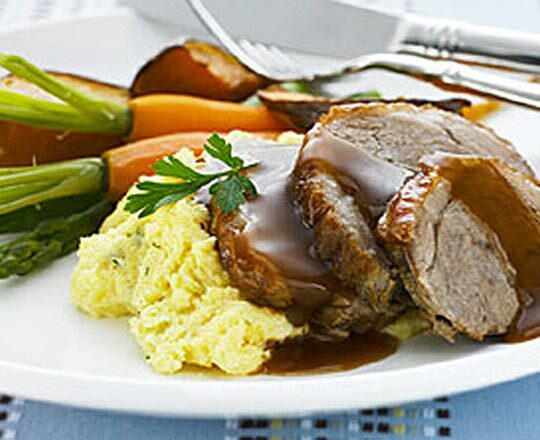 Place the lamb in a baking dish and roast in a moderate oven at 180°C for 30-40 minutes (40 for 1kg leg). Add pumpkin, toss in pan juices and cook for a further 30 minutes. Remove lamb from oven, wrap in foil and rest for 10-15 minutes before thinly slicing. Return pumpkin to oven and cook a further 10-15 minutes until tender. Bring water and milk to boil in a medium saucepan. Reduce heat to simmering and whisk in the polenta. Continue to whisk for 4-5 minutes or until the mixture comes away from the sides of the pan. Remove from heat and whisk in Philly*, Parmesan, parsley and seasonings. Divide polenta amongst serving plates, top with lamb slices, drizzle with gravy and serve with pumpkin, carrots and asparagus.